TEL AVIV, Israel--(BUSINESS WIRE)--Cardiosonic Ltd, a privately held company developing innovative and proprietary technology for tissue ablation, announced CE marking of its TIVUS™ (therapeutic intravascular ultrasound) ablative catheter device. The core of the company's technology is a miniaturized ultrasonic transducer, located at the tip of a flexible catheter, and capable of emitting ultrasonic waves which creates controllable levels of heat for selective tissue ablation. The first application of the TIVUS™ catheter is Renal Denervation (RDN) for the treatment of resistant hypertension. Animal testing has shown that the TIVUS non-focused ultrasonic energy penetrates the artery wall and causes nerve ablation at a depth range of 0.5mm to 10mm, enabling a more complete nerve ablation than Radio Frequency energy, which damages the vessel wall and penetrates half as deep as TIVUS. The TIVUS system has been evaluated in 2 multi-center clinical trials in Europe, Australia and Israel. The TIVUS II trial enrolled 25 patients and has shown an average reduction in blood pressure versus baseline of 38 mmHg. Benny Dilmoney, the company's CEO, commented: "The impressive drop in blood pressure is due to a high level of renal nerves ablation, made possible by the fact that ultrasonic heat waves penetrate much deeper into the artery tissues than any other ablation methods in use, mainly RF." 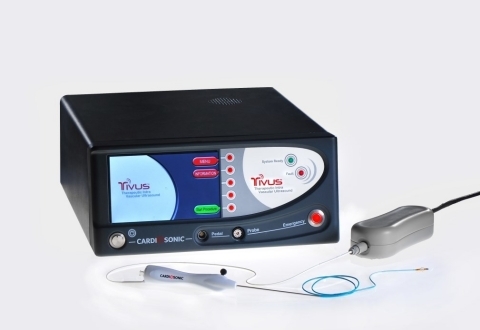 Cardiosonic now intends to carry out the TIVUS III study, which will further assess the TIVUS technology in a controlled manner. Mr. Dilmoney expressed confidence that the results obtained in the TIVUS II study will be replicated in the planned follow-up TIVUS III study. Other applications of the company's technology include the treatment of Pulmonary Hypertension, COPD, Asthma and Atrial Fibrillation (AF). The company has completed very encouraging preliminary animal work in all of these areas. Cardiosonic was founded in 2009 by Shmuel Almagor to develop and commercialize breakthrough ultrasound technology invented by Ariel Sverdlik, now the company's Chief Technology Officer. Cardiosonic Ltd, developing innovative and proprietary technology for tissue ablation, announced CE marking of its TIVUS™ (therapeutic intravascular ultrasound) ablative catheter device.